There are many kinds of flowcharts you and your team can use to improve your businesses. No matter which you choose, visualizing and analyzing different parts of your workflow will lead to improvements that save time and increase productivity. The following flowcharts are a great place to start. It is up to you, the entrepreneur, to determine which ones suit your needs best. As you will discover, each flowchart suits a particular situation. Remember that one diagram doesn’t fit all. Document Flowcharts show the controls over document-flow through the components of a system, i.e. through various business units. Data Flowcharts show the controls over data-flow in a system, i.e. the channels that data is transmitted through. System Flowcharts show the physical controls of data-flow through the components of a system, i.e. programs, servers, processors, and communication networks. Program Flowcharts show the controls in a program within a system. Swimlane Flowcharts depict who does what in cross-team processes. Workflow Flowcharts document office workflows, often involving tasks, documents, and information. Event-Driven Process Chain (EPC) Flowcharts document a business process. Specification and Description Language (SDL) Flowcharts brainstorm computer algorithms using three basic components: system definition, block, and process. Notice that the type of flowchart is determined by the kind of control, rather than the flow itself. Flowcharts provide entrepreneurs and teams with a wealth of information. This information can improve a single project or the company as a whole. Regardless the chart you choose to use, the benefits are immense for your business. When bringing together ideas from different people and teams, it’s important to ensure that all processes and steps are working towards a common goal. Because a flowchart requires you to detail a process from start to finish, it makes it easier to recognize redundant, disparate, or even contradictory parts of your process. Comparing your original ideas to your actual plans and processes can also bring to light areas in need of improvement. Most importantly, once problematic areas are recognized, they can be fixed. With a flowchart in clear view, you can addres all questions to ensure the team moves forward cohesively. Leaders and team members alike benefit from spelling out their teams work in such a way. In doing so, it aligns your entire team’s vision from the top down. Flowcharts aren’t a one and done exercise. They can be used to improve your work processes again and again. Flowcharts make it much easier to vet out new processes and ideas to ensure they fit within your current system. When they don’t, they provide you with a map for what else needs to be changed to ensure a seamless integration. Now, instead of just aligning ideas, your flowcharts are also proactively solving foreseeable problems. And flowcharts aren’t perfect. Sometimes when a process isn’t fully detailed, unexpected problems can arise. Luckily, if you have a flowchart already created, you can use it to assess each step of your process to discover what pieces weren’t thoroughly assessed. 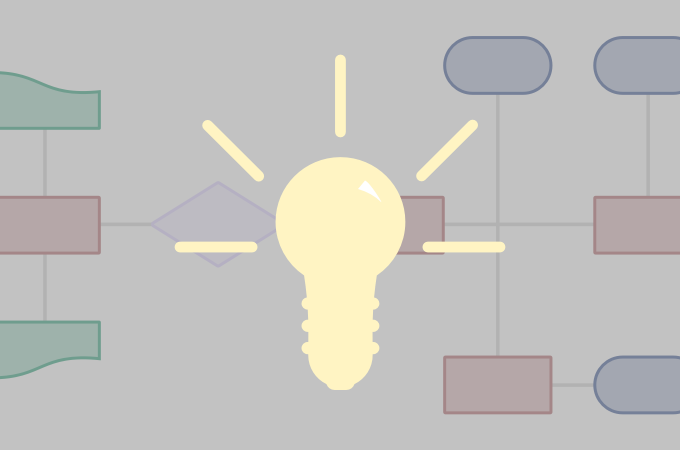 The benefits of flowcharts extend beyond project efficiency. In fact, flowcharts allow entrepreneurs to locate opportunities in sales, marketing, product development, and much more. Identifying areas of strength are great ways to inspire new strategies. Once you decide which areas of your flow you’d like to expand, you can use your flowchart to detail the steps necessary to achieve success. You should never discard a flowchart once a project is over. That’s because a flowchart not only identifies areas of improvement for a project, it becomes a viable teaching tool for you and your team. Early entrepreneurs and companies use their flowcharts to create best practices out of their most successful projects. Compile your flowcharts for team discoveries and education. Use them to educate other teams and get new hires up to speed. There’s so much more to get out of your flowcharts than just their initial use. Ready to create a flowchart? If you haven’t already, now is the time to incorporate flowcharts into your processes. Entrepreneurs especially benefit from flowcharts, which can shape workflows and company methods for years to come. Whether used as a one-project tool or a lifelong example, flowcharts bring efficiency and clarity to teams that improve processes for the better going forward.